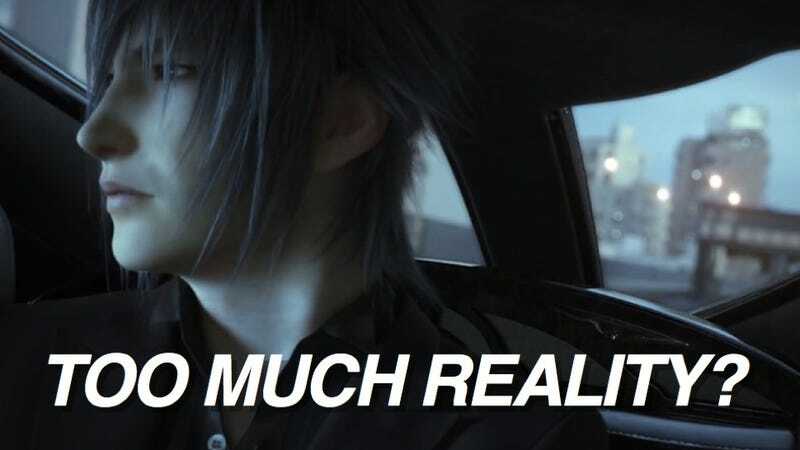 As the game's trailer states, Final Fantasy XV is a fantasy based on reality. A select group of Japanese gamers don't exactly seem thrilled with that. What is bothering a handful of players is that the latest game has elements that seem, I dunno, commonplace? That is, if you live in Japan. Here's what I'm talking about: The latest trailer recycles footage from a 2011 Final Fantasy Versus XIII trailer. As previously noted, that trailer features images of ETC booths. ETC is a highway toll system that is used in Japan. For the most part, the ETC booths look accurate—save for the giant armed guards and the blockade stumps. There's even a yellow safety vehicle (circled below), which you often see cruising Japanese highways. Some of the apartment buildings shown in the trailer also look exactly like you'd find in Japan. These banal Japanese motifs continue in the new FFXV trailer. On 2ch, Japan's largest internet forum, commenters are now noticing that the game has the country's police cars. Unlike the U.S., where patrol cars vary, the designs of Japanese police automobiles are uniform nationwide, differentiated by the regional name. Here's a reference photo, courtesy of Wiki. The squad cars in FFXV are near copies of Japanese police vehicles. But on the squad car, it reads in Japanese, "Royal Municipal Police Force". For some Japanese gamers, it probably feels odd to see a bland cop car next to a giant monster—maybe even vaguely jarring. That could be the point, though. It goes without saying that numerous locations in the trailer look absolutely nothing like Japan and echo Europe. Years ago, I seem to remember that Square Enix did acknowledge that the game, when it was called Final Fantasy Versus XIII, was inspired by locations in Japan and Italy. For Japanese, Europe is foreign, different, and exotic. It would seem closer to fantasy—even fantasy based on reality. But things like domestic toll booths and police cars are incredibly banal and commonplace. "Where's the fantasy?" asked one commenter on 2ch. "Guess they're not making fantasy anymore," added another. "Maybe, foreigners who like Japan will get into this," yet another commenter chimed in. It's odd that some people on 2ch are just realizing how the game seems to be inspired by Japan—especially, because, as hinted at above, the 2011 Final Fantasy Versus XIII trailer, the game's earlier incarnation, took place in what looks like Tokyo (see below). Naturally, Japanese game developers make Final Fantasy games. And, yes, it does make sense for FFXV's creators to gaze inward for inspiration. But for so long, they've looked to abroad to create a foreign or fantasy element for players—even if the characters are speaking Japanese. Thus, the inclusion of commonplace Japanese motifs might strike some gamers in Japan as slightly odd. Some didn't even think it was necessary to call the game a Final Fantasy title, while there were cries that the Japan inspired world was "cheap looking". That's not being derisive per se, but rather, it probably means that these elements hinder you from entering another world. Finally, one 2ch commenter quipped, "If they're going to set the game in Japan, then give the characters Japanese faces, too." Still, the game's not out. Perhaps these individuals, who are not speaking for all Japanese gamers, will come around, once the game is released. Maybe not.